Bleachweed is aptly named, as it emits a bleach-like smell​ when squished. It is a red seaweed with a flattened and highly-branched thallus ranging in colour from dark reddish-brown to blackish. Its main axis is strap-like, and its branches vary from small narrow teeth (mostly near the base and close to the main axis) to long, narrow, and pointed (lanceolate) blades. This thick, tough seaweed grows to 40 cm tall. This perennial species grows on rock from the mid intertidal to the upper subtidal; it may be found growing in tidepools. It occurs along semi-protected and semi-exposed shorelines, where wave action can provide more nutrients. Its range extends from southern Alaska to Baja California in northern Mexico. 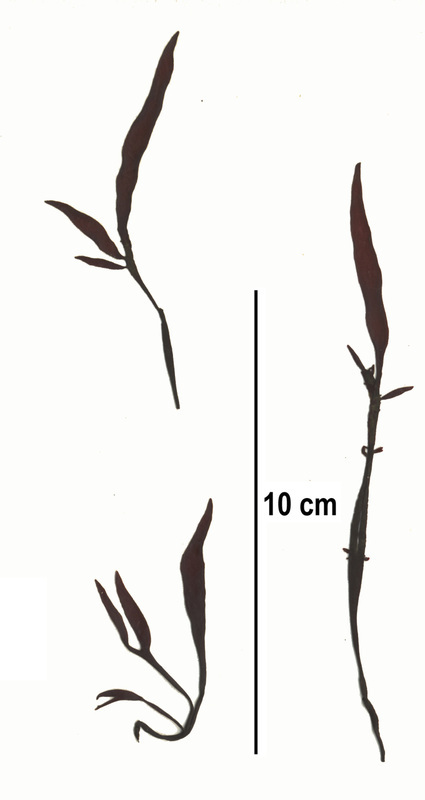 Narrow iodine seaweed (Grateloupia americana) is similar in appearance to bleachweed. It often is bleached yellow, especially during the summer, and its blades tend to curl. It as well as other Prionitis species also smell of bleach when crushed. The bleach smell seems to be a defense against grazing animals. Specimen collection number SCL 15348 in the UBC Herbarium Algae Database. Search the specimen collection number in the database for further information, or search the species for more information. Images courtesy of Sandra Lindstrom. Druehl, L. 2000. Pacific Seaweeds: A guide to common seaweeds of the west coast. Harbour Publishing: Madeira Park, BC, Canada. Pp. 118-119. Lindberg, M. and Lindstrom, S. (2010). Prionitis sternbergii Bleachweed. Seaweeds of Alaska. Accessed 07/10/2015.